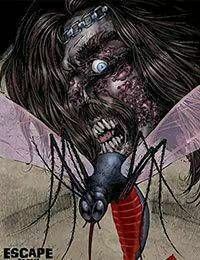 John Russos Escape of the Living Dead returns will an all-new tale of the continuing spread of the zombie virus... But now, its taken a different and even more treacherous turn! In the back woods of Pennsylvania in 1971, a bus filled with San Francisco-bound hippies and flower children are about to find peace and love replaced with fight or die as they are attacked in an unthinkable onslaught by flesh-hungry zombies. Stranded, trapped and surrounded by the living dead who lurk in the dark waiting to feast upon their gory remains, the ragged group of heroes will begin to fall, one by one... And thats before the arrival of enigmatic, zombie messiah Deadhead! There are no rescuers, no defense and no hope for survival after the Escape Of The Living Dead!